Greek Default Watch: Greece’s New Property Tax: Beginning of the End? For the past eighteen months I have believed in three things: (1) that the crisis facing Greece was, above all, a political crisis; (2) that the Greek government was serious in facing down powerful constituencies; and (3) that the aegis of an IMF-led program offered the right mix of carrot and stick for Greece to make these changes. I still believe No. 1 but I increasingly doubt No. 2 and No. 3. In fact, the newly proposed property tax was an inflection point for me: it turned me from an optimist into a pessimist. Why an optimist to start with? For two reasons. First, I believed that Greece needed to be in crisis mode for things to change – deep reforms in the country’s political economy would be unthinkable under a “business as usual” scenario. Second, I believed that the troika’s agenda was, more or less, sensible. It demanded cuts where cuts should be made, and it pressed for reforms where reforms should take place. I did have one worry: I recognized that reform and debt repayment were different things and that if pressed to pick, debt repayment would trump reform. There was reason to keep being optimist, I think, until just now. In my mind, the Greek program has gone through three phases. The first period came from the signing of the memorandum with the troika in May 2010 to the start of 2011. For about 8-9 months, the government was diligent. It succeeded in cutting the deficit quite impressively, and its deviation from the target could be easily explained by a deeper than expected recession. The government was also resolute in its reform agenda: it faced down truckers, port workers, and others who challenged new laws. It showed a strong commitment to change. Then it started to waver. Chiefly, it slowed its commitment to change. The second period lasted from the first quarter of 2011 until the passage of the medium term plan in the summer. The period was marked by four trends: a progressive realization that a deeper than expected recession would make the 2011 fiscal targets hard to meet; a second wave of structural reforms but with feeble implementation; the introduction of a broad set of measures, balanced between higher revenues and lower spending, in the form of the medium term strategy; and finally, an outright mutiny in the ruling party that almost toppled the government but that, instead, led to a cabinet reshuffle. By the end of the summer holidays, the government was again in a tough spot. Its fiscal targets were increasingly beyond reach. At that critical juncture, it chose to plug a fiscal hole by introducing an extraordinary levy on property to be paid through the electricity bill (a measure which, amusingly, the current finance minister called absurd and unfair only a few months earlier). The government is also meeting to consider additional measures, but so far, this is it. Now, of course, no program goes fully according to plan. It easy to miss targets, to take longer to pass reforms and implement them, to seek consensus by sacrificing expediency. These obstacles are expected. But a politician and a government reveal a lot about themselves by how they handle adversity. Faced with trouble, do they stand on firm principles that will guide them? Do they have a clear purpose and a sense of fairness? Do they know where they want to end up and have some idea of how to get there? Or do they dash for the exit, seeking the path of least resistance, opting for naked opportunism over thoughtful action? The property tax was naked opportunism. There is no doubt that a government faces a trade-off between good measures that yield results with time and less good measures that yield results instantly. And yet, this excuse becomes progressively less valid as time goes on. This is particularly so when one considers the alternatives available to the government – one being to set up special courts to expedite the collection of tax arrears, the other being to be more aggressive in cutting jobs and wages in the public sector. Together these two actions would enable a third crucial one: a tax break for consumers. These actions would signal both a willingness to tackle vested interests as well as demonstrate a sense of justice. More fundamentally they would reinforce a government message: we are introducing measures, often unjust, because we need to plug in a hole until the structural reforms kick in. But when you keep saying this, and when the structural reforms keep getting pushed back, how on earth can you keep justifying such measures? The truth is that when confronted with a pure grab versus more painful but more just measures, the government went for a grab. And a government with such instincts does not deserve a mandate to rule. 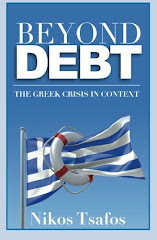 First, many thanks for an excellent blog which provides an useful angle on the Greek society. - Many would argue that a property tax is optimal in a country faced with capital flight. It could also foster the adoption of a national registry and facilitate the fight agaisnt tax fraud. Therefore could you enlarge on the reasons behind your negative judgement? - Regarding corporate tax arrears, do you know if some state-owned enterprises are included in the numbers you provided in a previous post (thereby making tax collection less appealling)? - Nutrition: Self supply instead of expensive import of international junk food. - Tourism: Attracting more solvent guests, providing international standards. Self-destructive strikes are no help. - Church: Substantial taxation according to the economical weight and activity. 2,5 mio € per year can't be serious? - Energy: Northern European countries are in permanent need of electricity, a large scale project with future. Thanks from Austria for Your interesting blog! Apla latrevw tis analyseis sou. Kanonikh ekpaidefsh to blog sou. H mallon, as min to prosvallw... To blog sou einai panta anoixto, exei panta yli, den exei katalipsi, den tou leipoun vivlia gia mathisi klp klp. Mpravo, Niko. Xilia mpravo. Roxanne - efxaristo poly gia ta kala sou logia :-) Polu xairomai pou to vriskeis endiaferon to blog! It would be interesting to hear your views on why you think the Greek crisis is a political crisis. Though creative government accounting (driven by political motivations) clearly played a major as to why the crisis was discovered later rather than sooner, it is clear that the cost of financing was too low for all of the PIIGS countries, as interest rates did not reflect the inherent riskiness of the economies. Are you on the way towards losing your first viewpoint as well? E.g. are you of the opinion that the Euro has not been a disaster just waiting to happen, right from the start? PS - I really like the format of your blog. I am just an economist and not a HTML junkie, and I badly need of some help with my own. Hi Nikos - I've found it hard to disagree with your writings in the past, and I can't disagee with you today. The latest announcements, specifically reducing the income tax threshold and pensions while promising, once again, to do something unspecified about civil service pay, are also a case of doing the easy things while putting off what needs to be done. Your initial believes, and the increasing disillusion reflect my own thoughts about a Greek recovery. However, I disagree with your point about the property tax. Imho it's a result of pure desperation, of the realistic insight by the government that any attempt to increase the revenue from the more afluent Greeks through the means of the tax collection office is bound to fail. Aparently, which seems to be bolstered by news reports, that entity is so riddeled with corrupt officials and deadbeats that it's basically dysfunctional. Thus, the pragmatic, some may even say innovative approach of trying to collect the taxes through the electricity bills, to ensure higher compliance. Sadly, it's the unions again which prevent this improvised solutions from succeeding. Imho, this shows two major obstacles towards any turnaround: Firstly, the administration HAS to be reformed or else that screwed up bureaucracy will ruin every attempt to increase the efficiency of the publlic sector and the income of the state. And secondly, without the unions finally accepting their responsility to constructively engage the clear and present problems, no real progress can be achieved, either. Sadly, it looks as if the Papandreou government, after a promising start, is now increasingly losing the necessary energy to adress those issues. The most recent proposals, like the weird idea to force the households to keep book about their financial transactions, smells of pure desperation and a devil-may-care attitude. That's a very worrying sign, and if this trend continues, this can't end well. These new property taxes may seem harsh to the economy, but measures had to be taken to cut the budget deficit and for the government to make a viable source for funding. Taxes being paid by the citizen should be used by the government accordingly and properly. If the government will be able to make a viable source for funding, then the people will never hesitate to pay taxes. Many people are in debt because of unemployment and received money from bank and the property is in debt. Same as in the U.S. will soon whole districts empty because the loans are not paid back. some 1000 people lose their house and sleep on road. Greece is poor and the property tax makes greece even poorer. No work, the house debt, everything was more expensive and the property tax ruined the country as can be observed in the U.S.. Unemployment is rising and poverty. Germany is not doing well. Many estates are for sale under the value before the bank pledged. I am sad when I see how the impoverished Germany, Greece exploits. Property Tax is punishment for homeowners. Does anyone have a German website for property tax and poverty.